To celebrate our brand new Becoming a Rockstar Instructor certification, we are a starting a brand new series that looks into what it takes to turn a typical instructor into a true rock star! The role of the Spinning® Instructor is to lead safe, effective and exciting rides that will deliver the physical and mental challenges that help riders achieve their goals. Spinning prides itself on certifying the world’s top fitness professionals to create the best indoor cycling experience for students. They are committed to learning more, advancing their career, and helping their students get in the best shape of their lives.With these goals in mind, we wanted to help take our instructors to the next level with our brand new certification, Becoming a Rockstar Instructor. This full-day course provides Spinning instructors with the advanced knowledge and motivational skills to attract more students and keep them coming back for more. It also helps them advance to the next level on the new Spinning Instructor Pathway.To celebrate the release of this course, we wanted to explore three characteristics of a truly great instructor; their knowledge, creativity, and delivery. Today, we will explore a rockstar instructor’s knowledge and how it serves as the foundation for any great Spinning class. We’ve also include a short quiz worth 1 SPIN® CEC! The Spinning program was born from road cycling, so exceptional instructors must consider the same physiological capabilities that are required of a great cyclist. Spinning requires continuous, highly repetitive pedaling work supported by a positive mindset and sound training principles. The energy expended during a Spinning class is a result of the amount of time and intensity of the work done during class. Intensity (work) is how demanding the effort is and how hard and fast the rider’s systems can turn over the resistance on the flywheel over time.Intensity is just one element of a great training program. It is the total ride experience that causes their body to respond and adapt. Great instructors will guide a balance of intensity throughout the core movements, with duration and frequency to produce a positive training response toward specific goals.Find A Rockstar TrainingResistance, cadence and riding position are variables that influence energy expenditure on the Spinner bike. The duration or time of the movement develops riders’ endurance, which is the glue that provides both physical and mental stamina. The application of these variables in the Spinning program supports the same foundation principles to boosting fitness in cycling.Because the Spinning program was modeled after real road cycling, cadence parameters are defined by terrain, with 60–80 RPM for hills and 80–110 RPM for flat roads. These two categories can be helpful to students for visualization purposes, but the best instructors use the full 60–110 RPM range as a tool to best suit the needs of each individual and the training session goal without limiting a certain cadence to a particular definition of terrain. Not only are these ranges reflective of what outdoor cyclists pedal, but they also reflect the muscular system’s ability to produce force and the cardiorespiratory system’s fitness to support speed and efficiency. From the first time you led a Spinning® class, you have most likely fielded questions about losing weight, calorie intake, building strength and boosting performance. These are all common experiences in the Spinning program. You may not have the answers to each of them right away, but continuing education will prepare you for responding to any rider’s specific needs. As an instructor, you need an understanding of the body’s energy and muscular systems to answer these questions and better aid your riders in reaching their fitness goals.The Becoming a Rockstar Instructor course provides a complete summary of the exercise science to support the practical application in Spinning classes.Just as the muscular system produces strength and power, the cardiorespiratory system transports oxygen, fuels muscles and eliminates waste products. In the same manner that the outdoor cyclist manages their strength to speed relationship, the Spinning® participant balances their resistance to cadence relationship, with riding position, rider’s stamina and individuality. 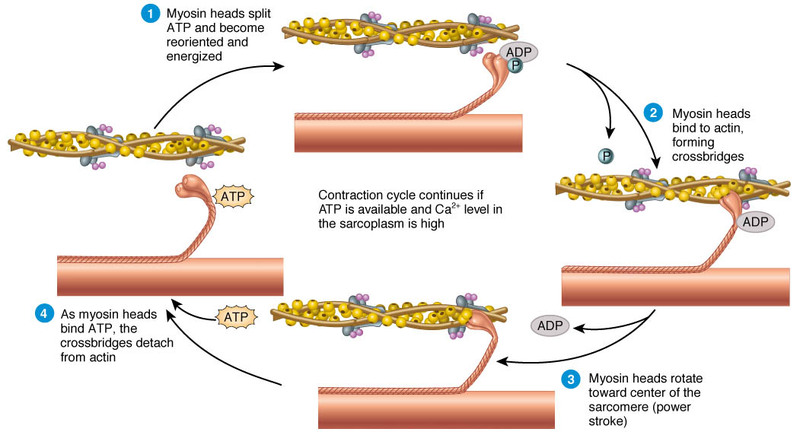 An important carrier of energy in muscle cells is adenosine triphosphate, or ATP. This molecular unit of energy is produced primarily from two energy systems; the aerobic system, which produces energy in the presence of oxygen, and the anaerobic system, which produces energy in the absence of oxygen. Glycogen (carbohydrates) and phosphocreatine (PCr) are fuels used during anaerobic metabolism, and both glycogen and fats are used during aerobic metabolism.This information is key to helping our riders achieve their fitness goals. As the rider’s intensity increases, there comes a point where the body produces byproduct and lactate faster than it can clear them. The ability to meet the demand for oxygen gradually decreases, and as a result, the anaerobic system becomes the predominant source of energy. In the Spinning program, this marker is called the Personal Spinning Threshold (PST), and it is used to validate aerobic and anaerobic training ranges. Above PST, the anaerobic system becomes the predominant energy source, as energy demands exceed oxygen supply. Since carbohydrates can be metabolized in the absence of oxygen, the anaerobic system uses them as a primary source of fuel in the form of glucose or stored glycogen. It is used primarily for intense exercise, supported by fast-twitch muscle fibers, lasting from approximately 30 seconds to three minutes. The Spinning program accounts for our bodies’ energy systems and muscle fiber types through the use of training ranges. These are known as the Spinning Energy Zones® and SPINPower® Training Zones. These zones are determined either by a rider’s percentage of maximal heart rate (MHR), a percentage of their PST, or rating of perceived exertion. In a Spinning class, recording and monitoring your heart rate with a heart rate monitor will provide a great indicator of the body’s reaction to the stress and stimuli placed on it. Using the age-predicted maximum heart rate formula (208 – [0.70 x Age]), aerobic training is typically below 80% MHR and anaerobic training is typically above 85% MHR. Therefore, threshold training would be performed at 80–85% MHR.In addition to reviewing these training zones, the Becoming a Rockstar Instructor course also explores the importance of power in our training. The most accurate measure of workout intensity on a bike today is with power meter technology. With Spinner bikes equipped with a power meter, the rider’s true effort is precisely determined versus estimated. It also enables a more accurate measurement of food calorie expenditure through kilojoules.Measuring actual intensity not only holds participants accountable for the work they do, but in some cases, the work they are not doing. This is why we encourage earning your SPINPower certification. Like the the Becoming a Rockstar Instructor course, it will advance you to the next level on your Spinning Instructor Pathway. Progress in fitness and performance is a direct result of the proper relationship between work and rest. The best possible outcomes are achieved when training includes progression phases of stressing muscles and energy systems in addition to appropriate recovery time. With this in mind, the work intensity, duration, and movement type are used to design Spinning classes. Overload, recovery and progression, manipulated by variables of frequency, intensity, time and type (F.I.T.T.) are the principles of fitness training and key components of great Spinning profiles.A great instructor creates profiles that appropriately train various systems and reiterate the training principles to benefit all riders. This gives them an explanation for the work ahead and inspires students to work toward their goals. So be sure to come back next month, as we explore how rockstar instructors use the tools in their arsenal to create life-changing rides! Ready to become a rockstar instructor? Test your scientific knowledge with this CEC quiz!